Our local non-emergency ambulances proudly display their allegiances as they drive by. 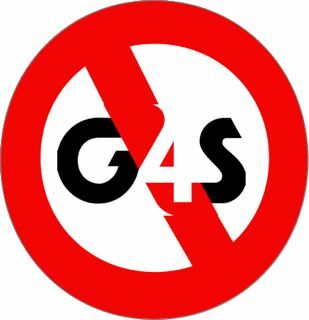 The G4S logo trumps the NHS in the statement emblazoned on the sides ‘G4S working in partnership with the NHS’. This partnership has resulted in the death of a double amputee when his unsecured wheelchair tipped over backwards as he was being transported to hospital in an ambulance operated by G4S. The employees had not been properly trained. Private firms have a history of saving on training and G4S certainly has form in this department. Their ‘just in time’ procedures left many Olympic guards waiting to be trained two weeks before the Olympics. So when I see the logo on the local ambulances I feel aggrieved. I pay taxes for a National Health Service, accountable and transparent, not for a service run by what I believe is a serial violator of human rights and international law which stints on training, the better to profit from a public service. Worth posting a few stickers on the ambulance when the chance occurs. First time I visited the local hospital and spied the waiting ambulances it was fine. 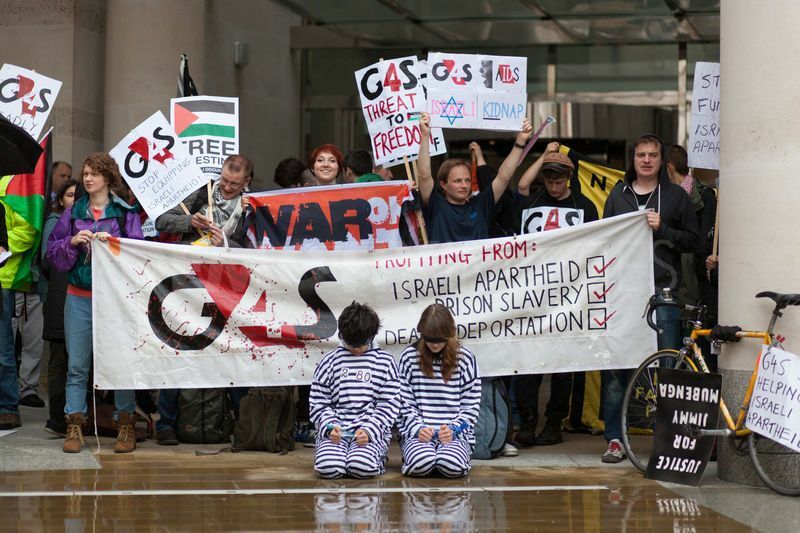 The second time I was seen by the driver who proudly sports the G4S logo on his chest. In true Ragged Trousered Philanthropist tradition, he shouted after me and shook his fist. My husband responded with a friendly wave and smile. While my husband was waiting in the outpatients for me to complete my treatment, a furious driver and manager came in to berate him. He was not intimidated and very loudly, so that all in the outpatients could hear, he gave them a short expose of the company they were defending, including the fact that it had been responsible for the death of a patient through lack of staff training. The manager stated that they were not interested and if we were caught again we would be reported to the police for criminal damage. So now we know. The company is uninterested in its shortcomings and only worried that it will be publicly challenged. The question arises as to who is guilty of criminality?